You are about to embark on an exciting journey of becoming the Best Swim Teacher for your Little Champion! Every newborn baby has the potential to become a Water Baby. The sooner a child discovers the freedom of buoyancy and underwater swimming, the more relaxed and independent he or she will become. Swimming allows babies to exercise their muscles, which helps in development of their motor, coordination and balancing skills. Research shows that early swimming also helps baby in building one’s sense of self-esteem, self-confidence and independence. It is also helpful in literacy and numeracy development of our brain. During the lessons, babies will learn how to enter water safely, hold their breath when they go underwater, turn and propel themselves to the side of the pool and finally climb out of the pool safely. Wondering how this is done? 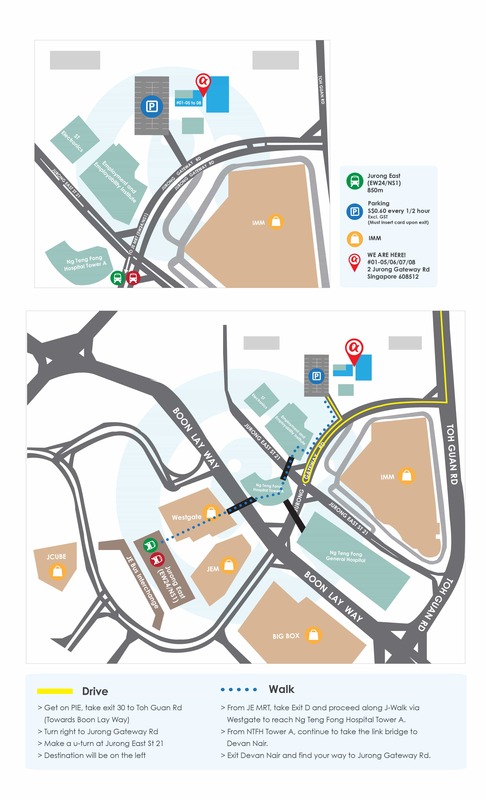 Follow the steps below and we’ll see you soon at the pool! 1. You are advised to come about 15 minutes earlier and get changed. Swim diaper is compulsory for all babies. 2. For hygiene purposes, please shower before entering pool. You are advised to enter the pool and begin warm up activities about 5 mins before lessons. Remember, do not start too early, as babies have short attention span. We want to keep them attentive during the lesson. 3. Be patient, be positive and have lots of fun; your child will take the cues from you. Please note that the lessons may be photographed and videoed for review, training and sharing purposes. Always put on your best smile! 4. 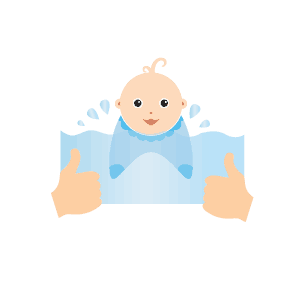 Do clean your baby after the swim with at least a quick shower, and dry their ears with a towel. Adjustable Swim Diapers Are Not Recommended! It is compulsory for all children below age 5 to put on a snuggly fitting swim diaper when they swim in our pool. 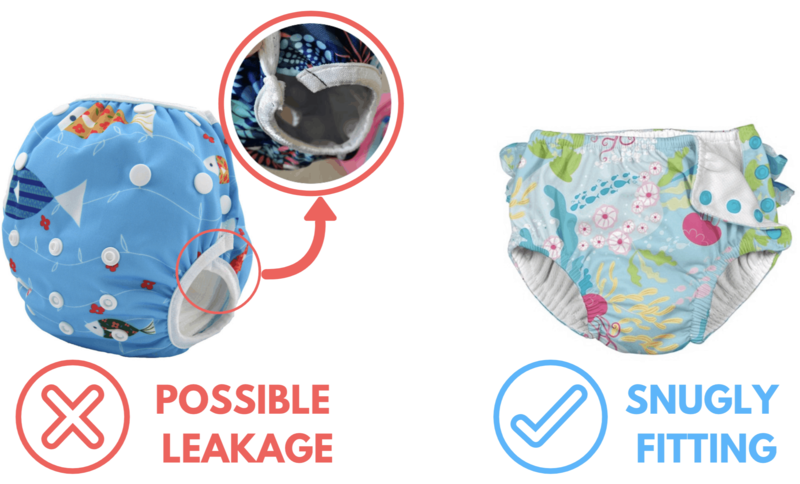 We DO NOT RECOMMEND any adjustable swim diaper as there are gaps (as shown in the picture above) that can cause leakage. Please approach our staff for a swim diaper recommendation if necessary. Children have to hold their breath underwater to swim while using multiple muscles to kick and paddle. 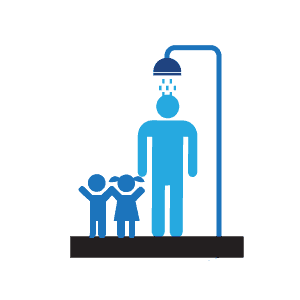 We noticed that many toilet-trained children are not able to control or communicate the need to visit the washroom in time. What happens when my baby cries during the lesson? When your baby cries during lessons, please do not get out of the water, as we do not wish to associate crying with leaving the pool. There are many reasons for babies crying during the lessons. 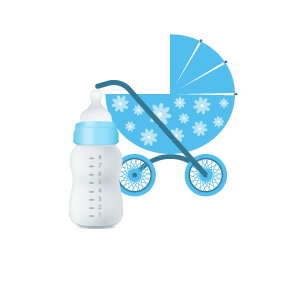 4 main reasons for babies to cry are: hungry, cold, sleepy, adapting to the new environment. Identify the cause of distress and solve everything in the pool. 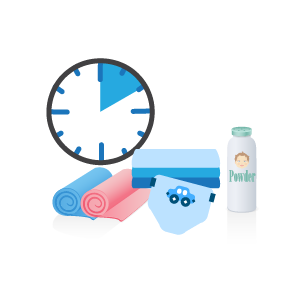 Ideally you should leave 30 minutes between milk feed and your baby’s swimming lessons for younger babies, and 1 hour for older babies on solid food. We understand that it is not always possible to plan when your baby is going to feel hungry, so do not fret too much over this! Must I be able to swim to take my baby for swimming? It is not necessary for you to be able to swim, in order to take your baby for swimming. You just need to be comfortable standing in the shallow water. And do bring along your swim goggles, if you want to see your baby swimming underwater.